Has everyone had a chance to wipe the tears from their eyes? 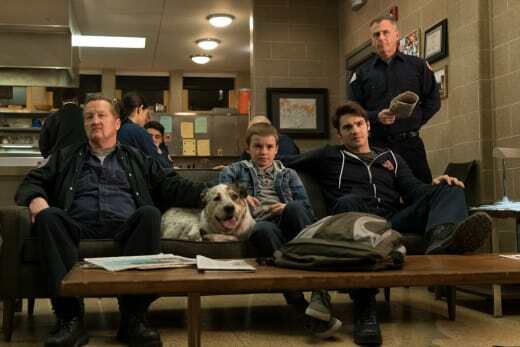 Poor JJ lost his mom on Chicago Fire Season 4 Episode 20, and while I had a feeling that would happen, it didn't make it any less heartbreaking. Severide really does have the worst luck when it comes to women. He really hit it off with Detective Holloway, and had she lived long enough, I think they could have been a solid couple. Severide already loves her son, and JJ loves him too. That's half the battle. Severide is made of the strongest stuff. I truly don't know how he kept it together all day without letting on that something was wrong, especially after he found out she didn't make it. Lucky for him, JJ had a school project to keep him busy. Too bad he'll probably never even turn it in now that he's most likely moving to California with his aunt. Will what happened to his mom affect his decision to be a cop someday? Who knows? Maybe it will make him want to pursue it even more; like Mills with firefighting. We'll probably never see JJ again, but there's a good chance Severide will keep in touch with him, at least for awhile. Casey might have been better off just keeping the $10,000 after having to deal with this Nelson guy. Political Consultant Susan came through for him, and I get the feeling we'll be seeing much more of her. Dawson doesn't like her, and their relationship is already on shaky ground. Casey working with Susan is probably not going to help matters as far as his love life is concerned. But, he really does need help with his political life. He has no idea what he's doing, and apparently doesn't know what the Board of Ethics does. He needs a crash course in politics or a copy of "Politics for Dummies" or something. She may be putting ideas in his head of being a senator or mayor someday, but he is nowhere close to being ready for something like that. Chicago is a big city. There's more than one hospital. So, you would think that Jimmy and Brett would have been directed to take their patient to one of those other hospitals, seeing as Chicago Med was supposedly on lockdown. That made no sense other than to set up the opportunity for Brett to talk to Will, but then they should have mentioned the lockdown was lifted. As suspected, Otis is still refusing to get the blood tests. I was glad Brett called him out on acting like a child. I get he's scared, but it would make more sense to start planning trips to Vegas after he receives a diagnosis. It's probably not even cancer, but if it is, I hope we don't have to go through several more episodes of him refusing treatment while the house tries to talk him into it. Drawing out getting the tests is bad enough. I could see both sides of the Cruz storyline. Two minutes can make a huge difference in a situation like that, but sometimes you have to do what your gut tells you. They have high-pressure jobs and have to make split-second decisions, and it's not like we've never seen Severide make similar ones. Cruz got the save, and it all worked out in the end. I liked Kidd's pep talk. What did you guys think of "The Last One for Mom"? Will you miss Pouch? Dogs can be very comforting when dealing with grief. JJ will appreciate the gesture. 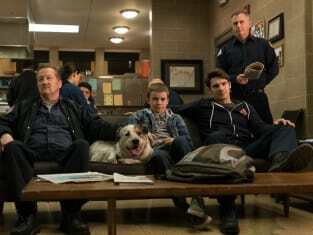 You can always watch Chicago Fire online and catch up on anything you missed.